Women who sell flower garlands and religious paraphernalia pray in their stands on the sidewalk during a Brahmin prayer at Erawan Shrine Friday morning. 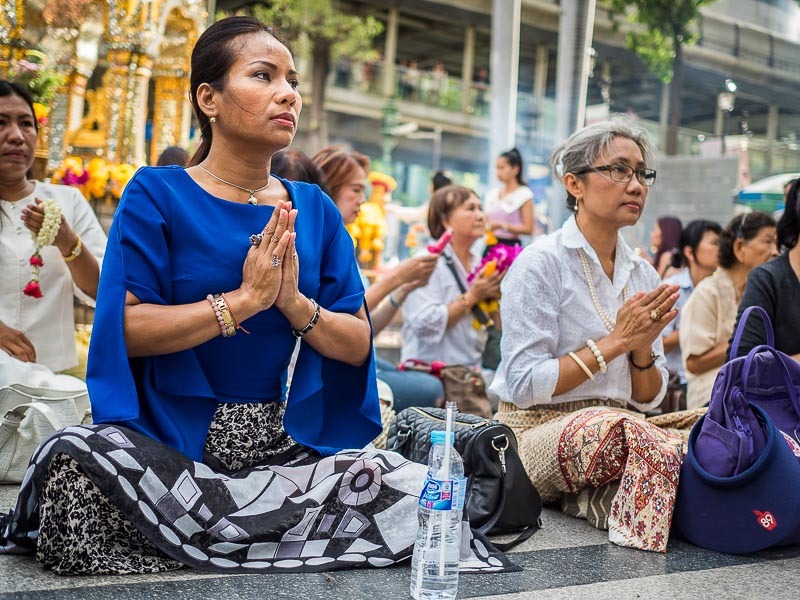 Bangkok is rushing headlong into restoring normalcy to Erawan Shrine and Ratchaprasong after the bombing there Monday night. The roads around the shrine were reopened Tuesday afternoon, less than 24 hours after the terror attack. The shrine reopened early Wednesday, less than 48 hours after the attack. Friday I covered a large interfaith prayer service to honor the victims of the bombing and restore confidence in the Ratchaprasong District. Thais who work in the Ratchaprasong area stop at the interfaith service Friday morning. 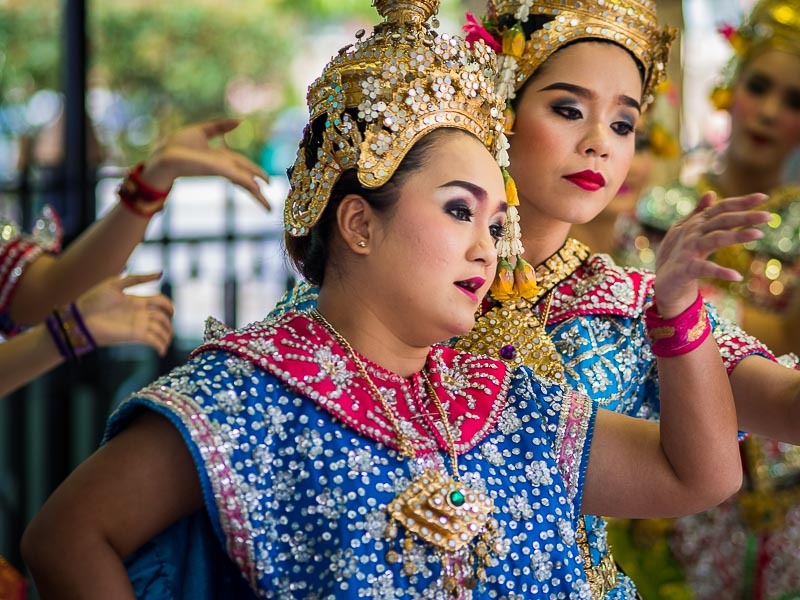 The tourism industry is one of the bedrocks of the Thai economy. It accounts for about 10% of the Kingdom's economic activity. Tourism has taken a beating lately. New "exotic" destinations, like Cambodia and Myanmar, compete for high end travelers. The murder of two tourists in Koh Tao and the apparently botched police investigation of their murder has hurt confidence among European visitors. Pattaya and Phuket used to be virtual Russian tourist enclaves, but the collapse of the Russian Ruble has cut into arrivals from Russia. Millions of Chinese tourists come to Thailand (based on the wild success of a Chinese road trip comedy movie), but Chinese tourists were killed in the bombing and that may cut into arrivals from China. 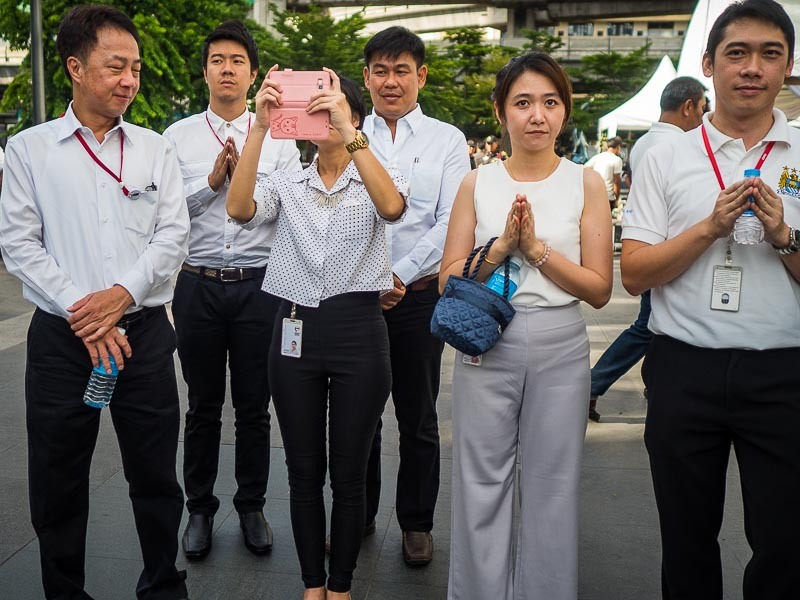 So Thai authorities have a big vested interest in getting things back to normal. 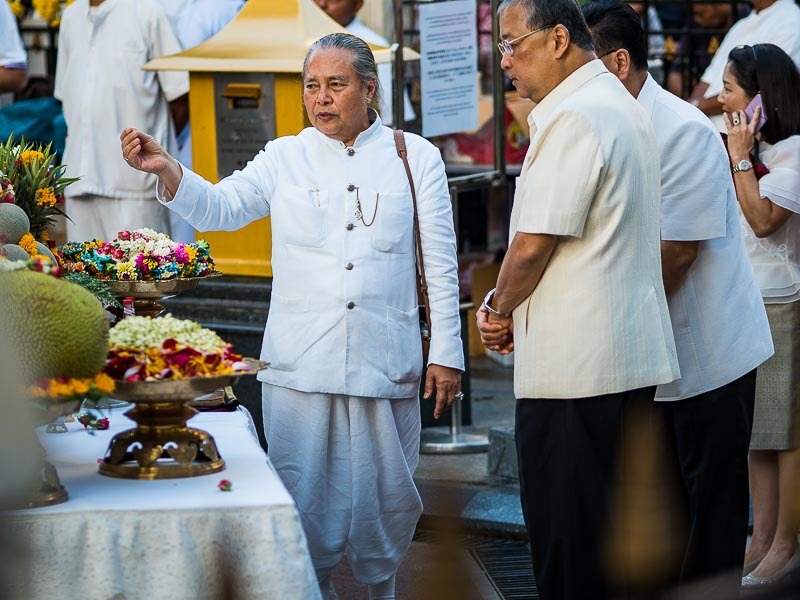 A Brahmin priest talks to Bangkok Governor MR Sukhumbhand Paribatra (right) before the prayer to bless the shrine. Thailand is a Buddhist country and the King, like most of the Kings of the Chakri dynasty, is a former monk. But the priests to the court are Brahmins (Hindu) and Erawan Shrine is actually a Brahmin, not Buddhist, shrine. Yet, almost all of the people who come to the shrine to pray are Buddhists. Photographers work the Brahmin prayer service at the shrine. Friday morning there was a large interfaith service in Rathchaprasong. 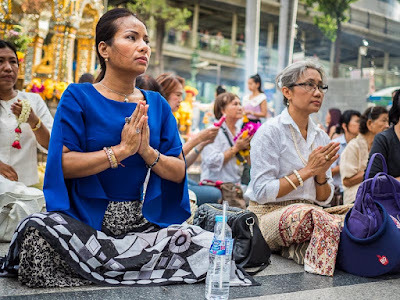 It started with a Brahmin prayer, open to Thai government representatives and VIPs, at the shrine. Then it moved to the plaza in front of Central World, the huge mall kitty corner from the shrine. 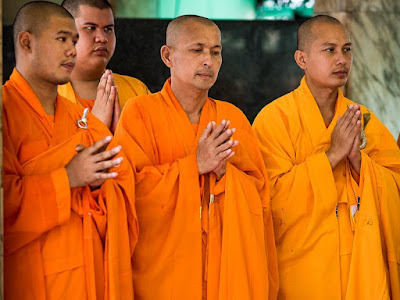 Prayers were offered by Theravada Buddhists (the school of Buddhism in Southeast Asia), Mahayana Buddhists (Chinese Buddhists), Muslims, Hindus, Sikhs and Christians. The service attracted a lot of people. 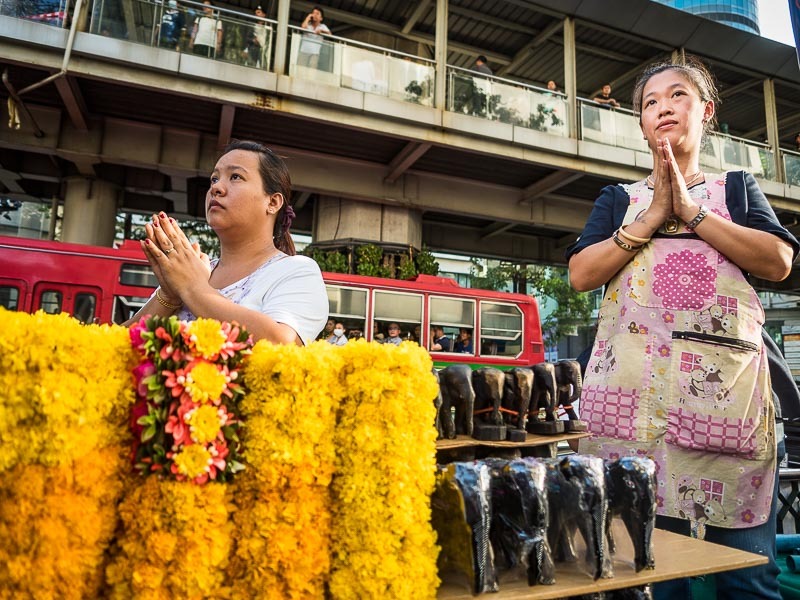 Tourists, Thai and foreign workers from the area, and regular Thais, like street vendors, all rubbed elbows. Some came to pray and make merit. Others were drawn by the spectacle of it. 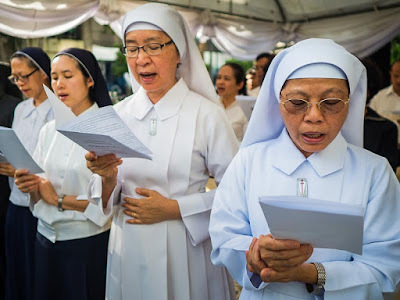 Thai Catholic nuns at the Christian service. 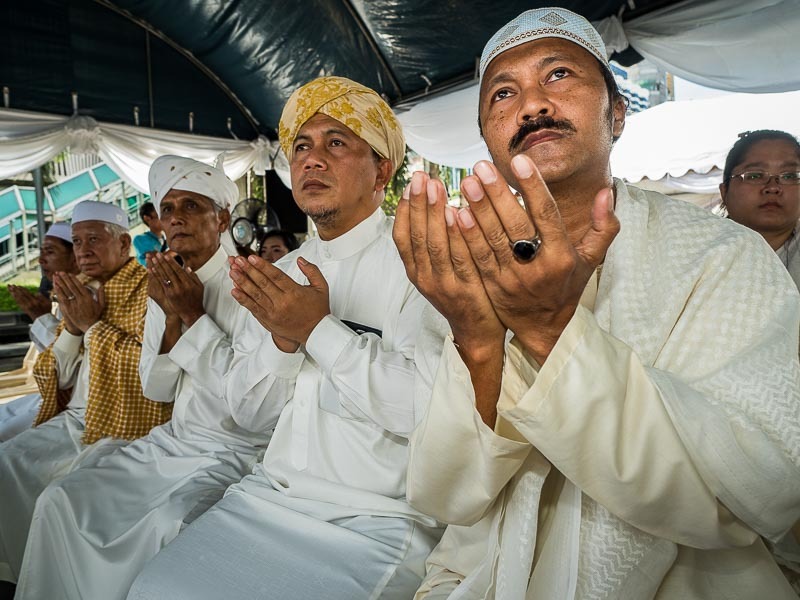 Imams in the Muslim service. After I photographed the interfaith service at Central World, I walked back to the shrine where monks were performing a Mahayana service. ...while people sat on the plaza around the shrine. After the prayer service ended, the dancers who perform at the shrine started performing. This is perhaps the most visible sign of the return to normalcy. People pay for the dancers to sing and perform behind them while they pray. The dancers are an integral part of the shrine. A woman prays while the dancers perform. The manhunt for the bomber is continuing. There have been updates from the government about the manhunt and possible suspects (including a confusing comment from the Prime Minister about the TV show "Blue Bloods"). The government is warning netizens to watch their words about the bombing and to avoid posting rumors about the attack. There has been some criticism of the handling of the investigation and the quick clean up. 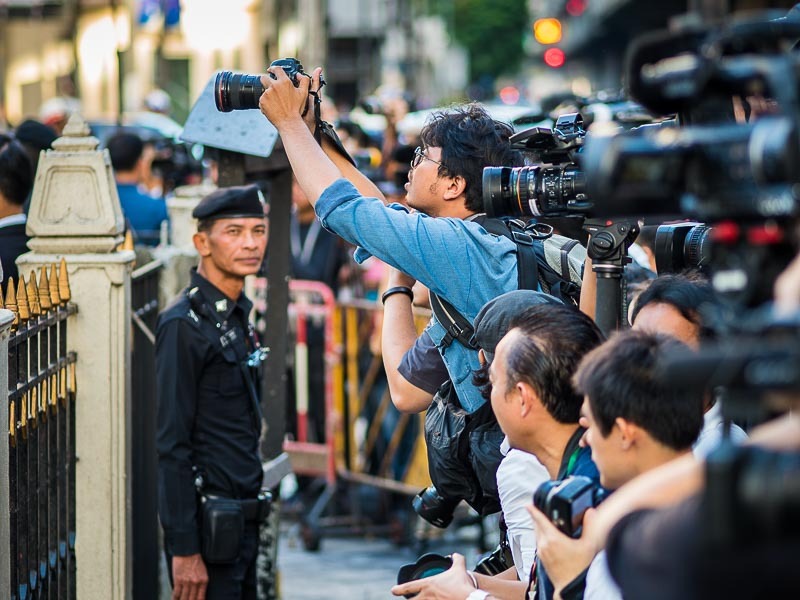 On Thursday, Jonathan Head, the BBC correspondent in Thailand, found shrapnel from the bomb embedded in a wall across the street from the shrine. There are more photos from the interfaith service and the bombing at the shrine in my archive.